Whatever happened to stock splits ? We seem to be in an investing world, in which $1,000-plus, per share prices aren't all that rare. According to data by investment research firm Birinyi Associates cited by the Wall Street Journal , the average stock in the S&P 500 Index is now trading above $98–a record. That compares with the average range of between $25 and $50 in recent decades. 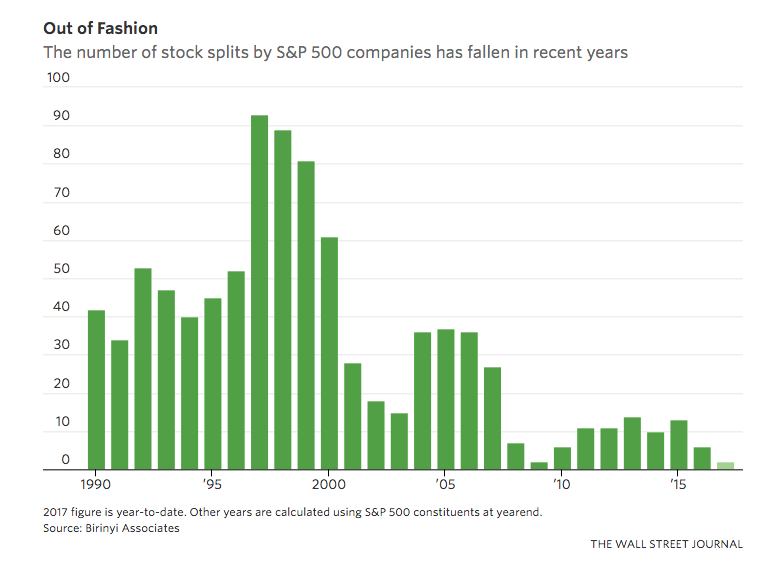 The Journal points out that only two S&P 500 companies have split their stock so far this year. Only six did so in 2016. Remember the roaring market of the late-1990s? In 1997, some 93 S&P 500 firms split their shares, according to data compiled by Birinyi . Back then, corporate boards liked stock splits, in which the outstanding shares are increased by a certain proportion but the overall value doesn't change. A 2-for-1 stock split, for instance, would be the equivalent of a company giving its investors two nickels for a dime. Back in the era of day traders and individual investors, stock splits were usually seen as a good thing, a sign of a management's confidence in the stock. Today individual investors tend to park their money in index funds and the financial firms that run them aren't crazy about splits since they tend to increase their trading costs. Companies also seem less interested in splitting their shares. The icon of the no-split school of course is Berkshire Hathaway . The company's A-class shares trade at nearly $250,000 a pop. 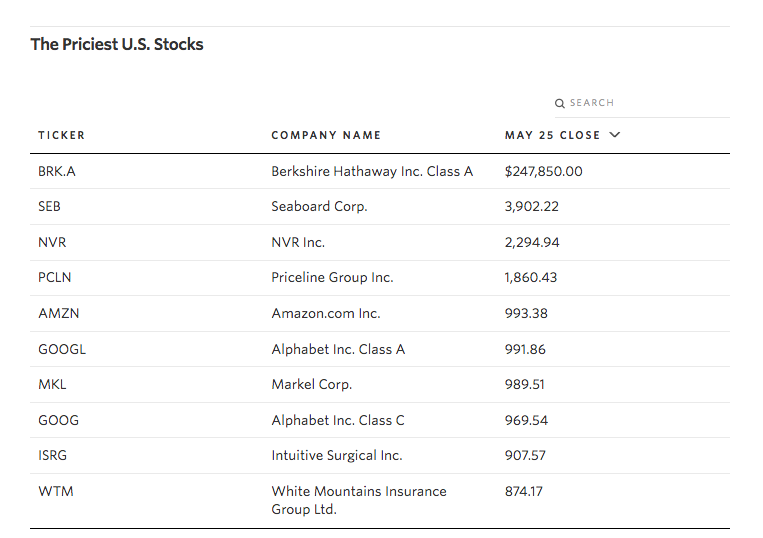 Berkshire Hathaway may seem like an outlier, but there are plenty of other stocks with per-share prices in the stratosphere. A share of multinational agribusiness and transportation conglomerate Seaboard Corp. (SEB) fetches nearly $4,000. Priceline (PCLN) trades at about $2,300 per share. In the current stock market environment, pricey stocks are more common. Stock splits are mighty rare these days in this era of index fund dominance. Unless you have a spare $250,000 hanging around, forget about buying a share of Berkshire Hathaway any time soon. The post Stock splits no more appeared first on Smarter Investing Covestor Ltd. is a registered investment advisor. Covestor licenses investment strategies from its Model Managers to establish investment models. The commentary here is provided as general and impersonal information and should not be construed as recommendations or advice. Information from Model Managers and third-party sources deemed to be reliable but not guaranteed. Past performance is no guarantee of future results. Transaction histories for Covestor models available upon request. Additional important disclosures available at http://site.covestor.com/help/disclosures. For information about Covestor and its services, go to http://covestor.com or contact Covestor Client Services at (866) 825-3005, x703.